I’m always on the hunt for easy meals that will make good leftovers. Casseroles definitely fit the bill. 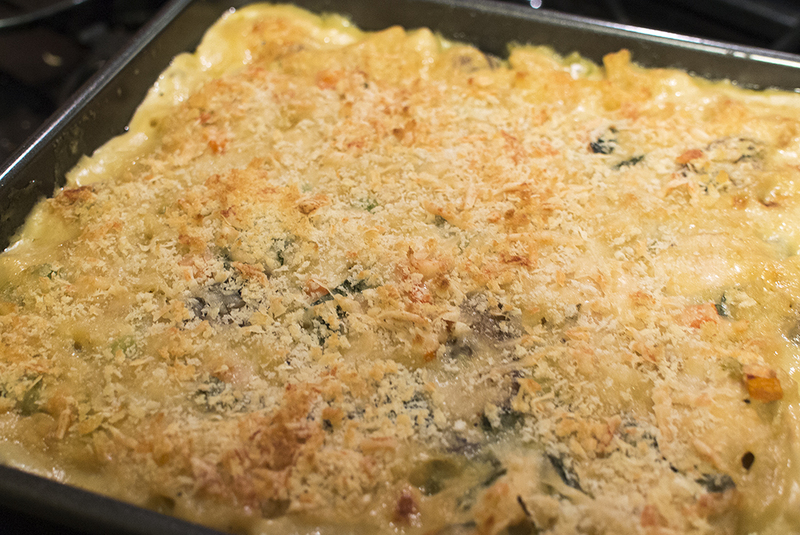 I realized I hadn’t really ever made a casserole, so I thought it high time to try my hand at it. Bring a pot of salted water to boil for the pasta. Preheat oven to 400 F. Butter a 3-quart baking dish. When water boils, add macaroni and cook until very al dente, several minutes shy of the package’s suggested cooking time. Drain, rinse and pat dry, then put in large bowl. In large saucepan over medium heat, melt 4 tbsp butter. Add mushrooms and season with salt and pepper. Cook until mushrooms have given up their liquid. Increase heat to boil away excess liquid, about 5 minutes. Add the scallions, thyme and garlic and cook until scallions are wilted, about 3 minutes. Sprinkle vegetables with flour and cook, stirring, until lightly browned. Add wine and cook until just absorbed. Pour in chicken broth and cream. Bring to a simmer and season with salt, pepper and nutmeg. Simmer until sauce is thickened, about 7 minutes. Stir in chicken, peas and carrots, parsley and simmer just to heat chicken through. Off heat, whisk in cream cheese until smooth. Pour the chicken and sauce into the bowl with macaroni and toss well. Spread in the prepared baking dish. In a small bowl, toss together breadcrumbs and cheese. Sprinkle breadcrumb mixture over the top of the baking dish. Bake until the casserole is very bubbly and the top is crispy and golden brown, about 25 minutes. The casserole dish tends to be quite full, so it’s a good idea to put a cookie sheet or aluminum foil on the rack below to catch any drippings. Let sit 10 minutes before serving. I’ve made this dish twice now, and I’ve enjoyed it both times. It reminds me a bit of a chicken pot pie (in casserole format), and I think it tastes even better on the second day. It is rich and flavourful, with a fun complexity from the nutmeg and parsley, mushrooms and thyme. Definitely one I’ll come back to.